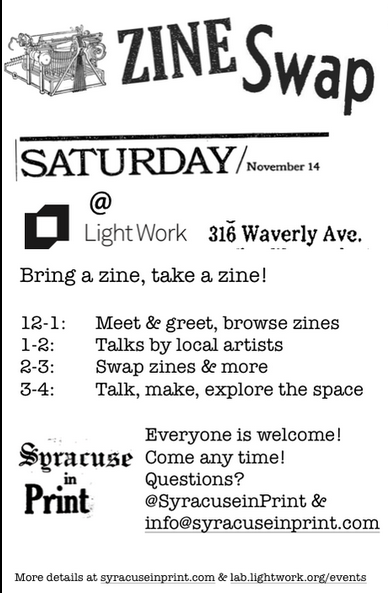 Please mark your calendars & add yourselves to our Facebook event page for Zine Swap!, happening at Light Work on for November 14, 2015 from 12-4 p.m.
Zine Swap is the excuse you need to tell your story, start an argument, or spread the word by doing it yourself through print. Make pamphlets, handmade books, comics, zines or some other printed publication — the point is to create and share your work with a community of authors who have done the same. 1-2: Talks by local artists—Illustrator Cara Luddy, Hex Records’ Ryan Canavan, and book arts expert, Peter Verheyen. If you have something to say, and can make and copy some kind of printed publication, then you should come! While we think you’ll have the most fun making something to share, if you don’t feel ready to make your own, come anyway and see what others have done. 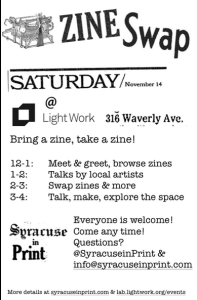 Zine Swap is brought to you by Syracuse in Print and Light Work. Syracuse in Print seeks to bring folks together to celebrate the past, present, and future of print culture. We host zine swaps, meet ups, and workshops, all building toward an inaugural print festival in Fall 2016. Light Work is an artist-run, non-profit organization providing direct support through residencies, publications, exhibitions, a community-access digital lab facility, and other related projects to emerging and under-represented artists working in the media of photography and digital imaging. Paid parking is available in the Booth Garage at the intersection of Comstock and Waverly Avenues, diagonally across the street from Light Work. 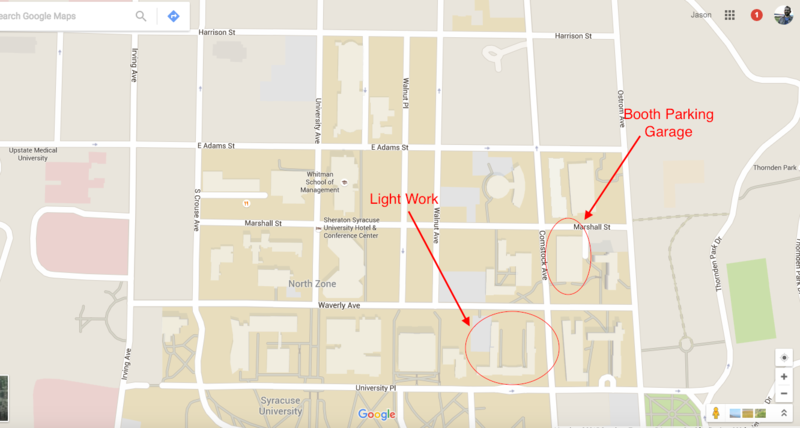 There is also metered parking in front of the Syracuse University Library, on Walnut Avenue, and on Comstock Avenue across from Booth Garage. Light Work’s gallery and office and the Community Darkrooms facility are located on the main floor of the Robert B. Menschel Media Center. Not sure what to write or which tools to use? Consider checking out Syracuse in Print’s “Make a Zine” page. Or attend Light Work’s Industry Night, where every other Thursday Light Work opens their doors and let anyone come in and print. Just that. For free. Bring your own paper, they’ll provide the rest.